1. Mat cream cardstock with a kraft blank card. 2. 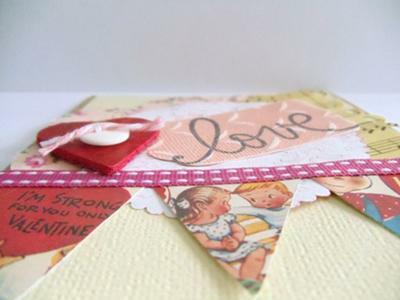 Die cut doily and tag, but make sure the cuts don't go all the way through on the doily. Mist doily and sand tag. 3. Add flower, punched patterned paper and doily. Make sure to use the other side than what use misted. 4. Add ribbon and pennants. 5. Cut a heart out of the linoleum. 6. 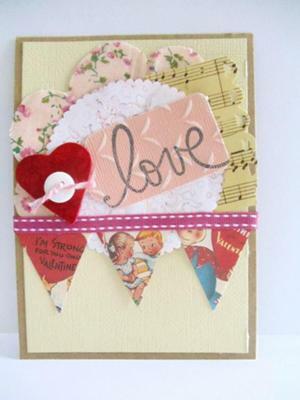 Add the heart, thread button and tag to the card.